This article is about the city in Rajasthan. For the city in Gujarat, see Jodhpur, Gujarat. For the riding breeches and boots, see Jodhpurs. Jodhpur (जोधपुर), is the second largest city in the state of Rajasthan in north India. It was formerly the seat of a princely state of the same name, also known as Marwar. Jodhpur is a popular tourist destination, featuring many beautiful palaces, forts and temples, as well as a stark, scenic desert landscape. The city is known as the Sun City for the bright, sunny weather it enjoys all year. 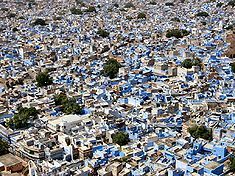 It is also referred to as the Blue City, due to the indigo tinge of the whitewashed houses around the Mehrangarh Fort. The blue houses were originally for Brahmins, but non-Brahmins soon joined in, as the color was said to deflect the heat and keep mosquitoes away. Jodhpur lies near the geographic center of Rajasthan, which makes it a convenient base for travel in a region that is frequented by a large number of tourists. The old city of Jodhpur is surrounded by a thick stone wall, which has six huge gates called Nagauri gate, Merati gate, Sojati gate, Jalori gate, Siwanchi gate and Chand pol. Flag of the princely state of Jodhpur. Jodhpur was founded in 1459 by Rao Jodha, a Rajput chief belonging to the Rathore clan. Rao Jodha succeeded in conquering the surrounding territory and thus founded a state which came to be known as Marwar. Since he hailed from the nearby town of Mandore, that town initially served as the capital of this state, however, Jodhpur soon took over that role, and remained so during the remainder of Rao Jodha's life. The city was located strategically on the road linking Delhi to Gujarat, which enabled it to profit from a flourishing trade in opium, copper, silk, sandals, date palms and coffee. Early in its history, the state became a fief under the Mughal Empire, owing fealty to them while enjoying limited internal autonomy. During this period, the state furnished the Mughals with several notable generals such as Maharaja Jaswant Singh. Jodhpur and its people benefited from this exposure to the wider world through the introduction of new styles of art and architecture and the increased opportunities that opened up for local tradesmen to make their mark across northern India. Jodhpur Panorama, spotted from the Mehrangarh Fort. The Mughal emperor Aurangzeb briefly retired the state in 1679 on the pretext of a minority, but the rightful ruler was restored to the throne after Aurangzeb died in 1707. The Mughal Empire declined gradually after 1707, but the Jodhpur court was beset by intrigue. Rather than benefiting from these circumstances, Marwar descended into strife and invited the intervention of the Marathas, who soon supplanted the Mughals as overlords of the region. However, this did not make for stability or peace, as 50 years of ruinous wars and humiliating treaties dissipated the wealth of the state, which sought and gratefully entered into a subsidiary alliance with the British in 1818. 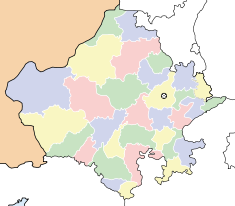 During the British Raj, the state of Jodhpur was the largest in Rajputana in terms of land area. The city prospered under the peace and stability of this era, and its merchants, the Marwaris, flourished and came to occupy a position of dominance in trade across India. In 1947, when India became independent, the state merged unto the union of India and Jodhpur became the second largest city in Rajasthan. Jodhpur is located at 26.29° N 73.03° E. It has an average elevation of 232 meters (761 feet). Extreme heat is common in the summer while the winters are very cold, which is a common characteristic of weather in the desert. The temperature varies from 49 degrees in the summer to one degree during the winter. As a flourishing center of trade in the sixteenth century, Jodhpur is still one of the leading centers for wood, wool, cattle, camels, salt and agricultural crops. In terms of agriculture, the most prominent crops grown in Jodhpur include wheat and the famous Mathania red chillies. Important minerals include gypsum, quartz, clay, dolomite, sandstone, and limestone. Much like other places in Rajasthan, Jodhpur has become well known for its handicrafts industry, which has grown in recent years to become the most dominant industry in the city. By some estimates, the furniture export segment is a $200 million industry, directly or indirectly employing as many as 200,000 people. Other items manufactured include textiles, metal utensils, bicycles, ink and sporting goods. A flourishing cottage industry exists for the manufacture of such items as glass bangles, cutlery, carpets and marble products. The Indian Air Force, Indian Army and Border Security Force maintain training centers at Jodhpur, likely because of the city's proximity to the border with Pakistan. 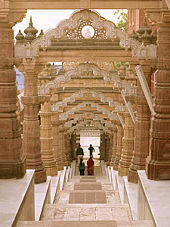 As of 2001 India census, Jodhpur had a population of 846,408. Males constitute 53 percent of the population and females 47 percent. Jodhpur has an average literacy rate of 67 percent, higher than the national average of 59.5 percent: male literacy is 75 percent, and female literacy is 58 percent. In Jodhpur, 14 percent of the population is under six years of age. Umaid Bhawan Palace: The Umaid Bhawan Palace is not only one of India's most imposing palaces but also among its most recent. Although it serves as a prime example of the lavish lifestyle of royalty, the monument was actually built for the more practical concern of providing public relief and employment during a long period of drought. Over one million square feet (90,000 m²) of the finest marble was used in the construction of the palace, and a special type of sandstone, called Chittar sandstone, has been used in constructing the palace, giving it a special visual appearance. For this reason, it is also referred to as Chittar Palace by the locals. Its style of construction, with beautiful balconies, charming courtyards, green gardens and stately rooms, makes it a fine example of Indo-Saracenic architecture. The project employed three thousand artisans over a period of 15 years between 1929 and 1943. It is named after its builder, Maharaja Umaid Singh (1876-1947), who was incidentally the president of the British Royal Institute of Architects. In 1977, the palace was segmented into the royal residence, the Heritage Hotel and a museum. Its 98 air-conditioned rooms are elegantly decorated with antique furniture as well as all the other amenities of a five star hotel. Mehrangarh Fort: The Mehrangarh Fort lies at the outskirts of Jodhpur city and is located atop a 125 m high hill. Its powerful size and appearance makes it one of the most majestic and one of the largest forts in India. It was originally started by Rao Jodha, the founder of Jodhpur in 1459. However, most of the fort dates from the period of Jaswant Singh (1638-1678). The walls of the fort are up to 36 m high and 21 m wide, and they enclose some exquisite structures within. The fort museum houses an exquisite collection of palanquins, howdahs, royal cradles, miniatures, musical instruments, costumes and furniture. The ramparts of Mehrangarh Fort provide not only excellently preserved cannons but also a breath-taking view of the city. Jaswant Thada: The Jaswant Thada is a pearly white architectural landmark that was built in 1899 in memory of Maharaja Jaswant Singh II (1875-1895) out of white marble. The monument in its entirety was built out of intricately carved sheets of marble, and the stones are so extremely thin and polished that they emit a warm glow when the sun's rays dance across their surface. Within the monument, there are also two more tombs. Osiyan Temple: This is an ancient Jain temple that lies about 60 km outside of the city of Jodhpur in the village of Osiyan. Kaman art gallery: The Kaman art gallery is a contemporary Indian art gallery, and the first such gallery to open in the state of Rajasthan. On display are various works by many famous Indian contemporary artists. A number of Indian delicacies have originated in Jodhpur. Some of the most prominent include Makhaniya Lassi, Mawa Kachori, Pyaaj Kachori, Hot and Spicy Mirchibada (A preparation made with potato, onion, chili and gramflour), Panchkuta, lapsi (a special kind of desert made with wheat, gud (raw sugar), and ghee), kachar mircha curry (made with chili and kachar, a special type of vegetable grown in the desert areas of Rajasthan) and Kadhi (made with gramflour, curd and chili). ↑ Jodhpur.nic.in. Retrieved April 23, 2012. ↑ Census of India : Provisional Population Totals Paper 1 of 2011 : Rajasthan. Retrieved April 23, 2012. ↑ United Nations World Urbanization Prospects Retrieved April 23, 2012. ↑ Falling Rain Genomics, Inc - Jodhpur Retrieved February 26, 2008. This page was last modified on 9 May 2018, at 16:40.